Glycerin is a transparent, thick liquid with a sweet taste. It is a byproduct of soap and bio-diesel manufacturing, and is used in a variety of items, from diaper cream and candy to antifreeze and shampoo. Experimenting with glycerin is fun because it usually changes the consistency and conduct of other constituents with only a few drops, thereby giving the satisfaction of an instant visible reaction. With glycerin, you can produce your own toothpaste at the kitchen table and compare the result with commercially-available products for experimental purposes. Mix the glycerin with baking soda, salt and flavorings to produce the paste. Boil some white eggs with food coloring or tea leaves, then test the homemade toothpaste by brushing the eggshell with it. Follow up by brushing another egg with the commercial toothpaste and compare the results. Notice that the homemade toothpaste remove more coloring than the commercial product. Experimenting with soap bubbles is a fun activity for children and adults, particularly when glycerin is added to the soap solution. Bubbles without glycerin burst as soon as they come into contact with a surface. When glycerin is added to the solution, the lifespan of the bubbles is prolonged considerably. The glycerin attracts and binds water molecules, and prevents them from evaporating. The result is a denser, more elastic surface that bounces easily without bursting the bubble. Making taffy with glycerin is a fun activity because it gives the promise of a sweet result and has the additional benefit of a physical exercise. Mix sugar and cornstarch before stirring in syrup, water, butter, salt and glycerin. Heat the mixture until it reaches a temperature of 270 degrees Fahrenheit. Remove the taffy from the heat, add food coloring and flavorings of your choice, and pour the thick substance on a flat surface. When it cools down, pull the mixture until it is noticeably lighter in color. For experimental purposes, repeat the procedure without the glycerin and you will notice the taffy is more difficult to stretch and has a less creamy taste. Experiment with dye and glycerin when preserving plants. Dry some flowers the traditional way by hanging them upside down. 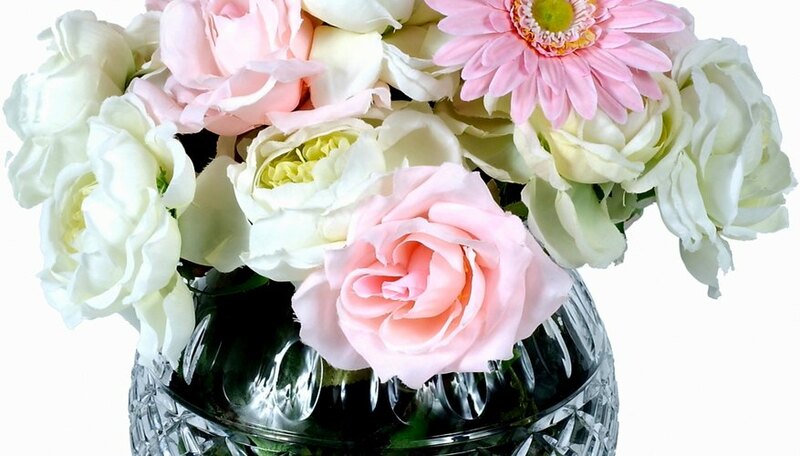 Place the same kind of flowers in a tall vase with a water and glycerin mixture for a week, then compare the results with the traditionally dried flowers. The air dried flowers are brittle and delicate, while the foliage and flower heads of the plants in the glycerin mixture are elastic and pliable. Alternately, you can have some fun by adding various colored dyes to the water and glycerin solution and see how the plants absorb the dye during the preservation process. Turnbull, Petra. "Fun Glycerine Experiments." Sciencing, https://sciencing.com/fun-glycerine-experiments-10056057.html. 25 April 2017.